I’m finding that allowing my natural curiosity about others to express, following my interest and joy in exploring with people and allowing my excitement at my knowing of what we, as humans, are capable of, is giving me a much more joyful and prosperous experience of coaching, and indeed of life, than endlessly ruminating over my own perceived limitations. During all those years of coaching and training, all those sessions with my own coaches, webinars & bootcamps, I heard the term so many times and I thought I got it. But it took a while for the penny to really drop, for the understanding to become part of my bones - it actually isn’t about me. Working on my ‘self’ in any form, and deepening my own understanding of how life works is mostly invaluable. But unless I’m going to pay myself an income for that impact, only putting my energy there wont bring me the prosperity I desire. If I want to create income I have to be an agent for impact for others. I am not the impact, that is entirely down to the person in front of me, but I do play a role, and I have seen over and over again that role is really one of simply loving the person in front of me, believing in them beyond any notions and stories they have of themselves, and my own deep, inner knowing of what that person in front of me is capable of. THAT excites me. And THAT is not about me. 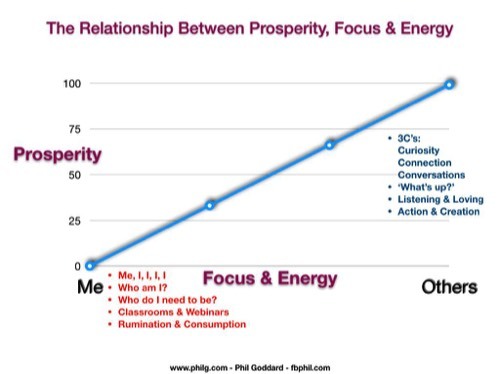 This little graph sums up the relationship between my prosperity, be it financial wealth or any other measure of a prosperous coaching life, and where I put my energy and focus. When I am taking action in the service of others, as opposed to dining out on my self-obsession, my life becomes more prosperous. It’s not a linear relationship, and often income shows up in ways that look totally unrelated to where I have put energy, except it isn’t. It always shows up in relation to how I am being of service to others, and the basis of that service is always love and curiosity. I don’t go out to teach others anything. I go to learn about them. I simply love them. Love does any teaching. This doesn’t just apply to coaching, of course. It seems to be the case with just about any business, and many areas of our lives. We explore this and much more in Thrive, my unique intimate group for coaches wanting to grow and develop their practice.